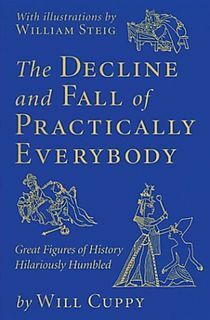 The Decline and Fall of Practically Everybody, one of the funniest books ever written, was penned by Will Cuppy. The fact that he is virtually unknown today goes to show how messed up today is. From Indiana and a graduate of the University of Chicago, Cuppy was a staple of the New Yorker during the 30s and 40s, and wrote his weekly column “Light Reading” for the New York Herald Tribune for 23 years. A wonderfully funny writer, he should be more well known, and of course more often read. Thankfully most of his books are still in print and available. Get some today. (1951) How to Get from January to December, New York: Holt. Edited by Fred Feldkamp. Illustrations by John Ruge. (1950) The Decline and Fall of Practically Everybody, New York: Holt. Edited by Fred Feldkamp. Illustrations by William Steig. (1949) How to Attract the Wombat, New York: Rinehart. (1944) The Great Bustard and Other People (containing How to Tell Your Friends from the Apes and How to Become Extinct), New York : Murray Hill Books. (1941) How to Become Extinct, New York: Farrar and Rinehart. Illustrations by William Steig. (1929) How to Be a Hermit, New York: Horace Liveright. (1910) Maroon Tales, Chicago: Forbes & Co..
(1946) Murder Without Tears: An Anthology of Crime, New York: Sheridan House. (1943) World’s Great Detective Stories: American and English Masterpieces, New York, Cleveland: World. (1943) World’s Great Mystery Stories: American and English Masterpieces, New York, Cleveland: World. This entry was posted in Lit and tagged Books, Humor, Will Cuppy by Sir Edward Percival Fox-Ingleby, Bt. Bookmark the permalink.